The electric motor (cooling fan) is controlled by the engine coolant temperature, refrigerant pressure and vehicle speed. It may sometimes operate even when the engine is not running. Use extreme caution when working near the blades of the cooling fan so that you are not injured by a rotating fan blades. As the engine coolant temperature decreases, the electric motor will automatically shut off. This is a normal condition. If your vehicle is equipped with GDI, the electric motor (cooling fan) may operate until you disconnect the negative battery cable. If the coolant level is low, add enough specified coolant to provide protection against freezing and corrosion. Bring the level to F, but do not overfill. 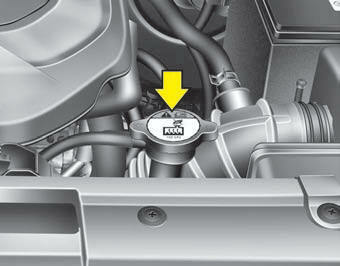 If frequent additions are required, see an authorized Kia dealer for a cooling system inspection. Do not remove the radiator cap when the engine and radiator are hot. 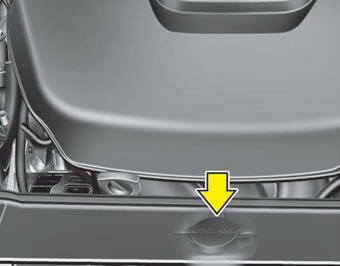 Scalding hot coolant and steam may blow out under pressure which may result in serious injury.